According to results of a phase I/II study, men with metastatic castration-resistant prostate cancer (mCRPC) who received a second course of radium-223 (Xofigo) experienced minimal hematologic toxicity and low radiographic bone progression rates. In the study, 29 of 44 patients (66%) received the full course of 6 injections. Median time to total alkaline phosphatase was not reached. Median time to PSA progression was 2.2 months. Median time from end of initial radium-223 treatment was 6 months. At 12.8 months maximum follow-up, median radiographic progression-free survival (rPFS) was 9.9 months. Thirteen patients (30%) experienced rPFS events. One patient had confirmed radiographic bone progression, 8 had soft tissue or visceral tumor progression, 2 had radiographic progression with incomplete documentation, and 2 died without evidence of radiographic disease progression. 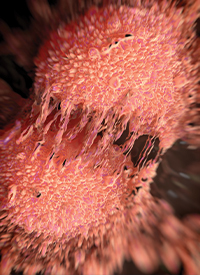 Among 8 patients with soft tissue or visceral tumor progression, 1 received concomitant hormonal therapy with abiraterone acetate (Zytiga) during treatment. The study was designed to assess the safety of re-treatment with up to 6 radium-223 injections, administered at 4-week intervals, to mCRPC patients who previously received a full course of radium-223. Additional efficacy objectives included radiographic disease progression, total alkaline phosphatase, PSA responses, overall survival, symptomatic skeletal events (SSEs), and pain outcomes. A total of 59 patients from 7 countries enrolled in the trial. Adults with pathologically confirmed mCRPC who had previously completed a full course of radium-223 with no evidence of bone progression during initial treatment were eligible for inclusion. Patients had either radiologic or biochemical/clinical progression after initial treatment. Patients with treatment-related serious or grade 3/4 adverse events (AEs) during or after initial treatment that did not resolve or led to treatment discontinuation were ineligible. Patients with visceral metastases ≥1 cm in diameter measured ≤30 days from treatment start or who received chemotherapy after their initial course of radium-223 were also excluded. All patients had received at least 2 prior hormonal regimens, and 73% developed disease progression following prior therapy with abiraterone or enzalutamide (Xtandi) and eventually developed disease progression. Twenty patients (44%) had at least 1 prior chemotherapy regimen. Four patients discontinued prematurely due to radiographic progression, 6 for clinical progression, 3 for an AE not associated with clinical progression, and 2 for patient request. Five (11%) patients died and 8 (18%) experienced first SSEs. Median OS, time to first SSE, and SSE-free survival were not reached. Five (14%) of 36 evaluable patients experienced pain progression. After 2 years of follow-up, 28 (64%) patients died, and the median OS was 24.4 months. Forty-one (93%) patients experienced at least one any-grade TEAE. There were no grade 4/5 hematologic TEAEs, and no cases of myelofibrosis, aplastic anemia, or other forms of myelosuppression of any grade reported. The most common nonhematologic TEAEs were fatigue (27%), nausea (25%), and diarrhea (20%). Those AEs were all grade 1/2, except for a single incidence of grade 3 nausea. Eighteen patients (41%) experienced a grade 3 TEAE including hypertension (11%) and anemia (5%). Thirteen patients (30%) experienced treatment-emergent serious AEs, though only a single case of dehydration was considered treatment-related. Twenty-two patients (50%) experienced treatment-related TEAEs, including grade 3 anemia and thrombocytopenia (5%). Investigators said neutrophil, platelet, and hemoglobin values were relatively unchanged over time. One patient experienced a treatment-related TEAE (thrombocytopenia) leading to dose delay or discontinuation. One patient experienced treatment-related TEAEs (fatigue and influenza-like illness) leading to permanent discontinuation. Of the 5 patient deaths, 1 occurred during the treatment period. Two deaths were attributed to disease progression, 2 were attributed to AEs not associated with clinical disease progression, and 1 cause of death was unknown. Sartor O, Heinrich D, Mariados N, et al. Re-treatment with radium-223: first experience from an international, open-label, phase I/II study in patients with castration-resistant prostate cancer and bone metastases. Ann Oncol. 2017; 28(10):2464-2471.